Researchers with UCLA’s Jonsson Comprehensive Cancer Centerreport that two new experimental drugs have shown great promise in the treatment of patients with non–small-cell lung cancer, which accounts for about 85 percent of all lung cancers. Lung cancer is the leading cause of cancer death in the United States. The drugs — ramucirumab and CO-1868 — were shown in separate clinical trials to increase survival times with fewer toxic side effects than standard treatments. The findings were presented this week at the American Society of Clinical Oncology annual meeting in Chicago. The standard therapy for patients with non–small-cell lung cancer after initial therapy, or when their disease worsens, is chemotherapy with a single drug. Overall, survival time among these patients is generally about 6 to 9 months. Less than 10 percent of patients respond to therapy, and even then, responses are usually of short duration. Dr. Edward Garon, an assistant professor of hematology–oncology and member of the Jonsson Cancer Center, conducted an extensive multi-year Phase 3 clinical trial testing the investigational drug ramucirumab in a population of 1,253 patients with non–small-cell lung cancer whose cancer had progressed during or after first-line chemotherapy treatment. Ramucirumab, which is being developed by Eli Lilly and Co., is an antibody that targets VEGFR-2, an extracellular protein that is important in the formation of the blood vessels that support cancer cells. 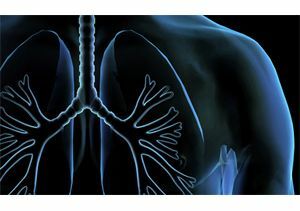 Patients were given ramucirumab in combination with docetexal, a clinically approved chemotherapy drug considered the cornerstone of second-line treatment in advanced non–small-cell lung cancer. Response to ramucirumab — that is, individuals whose tumors shrank — was 23 percent at the time the study was analyzed. The drug is the first new therapy for previously treated non–small-cell lung cancer pateints to improve overall survival, with findings showing a progression-free survival rate of 4.5 months and median overall survival of 10.5 months. "We are excited to have a drug that lengthens survival time in lung cancer patients, who often have few options," Garon said. "Although adverse effects were experienced by patients, most commonly neutropenia, fatigue and hypertension, toxicities were largely manageable with appropriate dose reductions and supportive care, and without substantial reduction in planned dose intensity." The research appears in the June edition of The Lancet. One example of targetable mutations in lung cancer involved the identification of the EGFR (epidermal growth factor recepator) mutation. The discovery has resulted in a new class of targeted therapeutic agents called EGFR tyrosine kinase inhibitors. And while these inhibitors have delivered promising results, the duration of benefit to patients still remains relatively short, with progressive disease generally occurring about a year after the beginning of treatment. Tyrosine kinase inhibitor treatment is also complicated by side effects such as diarrhea and skin rash. Recent studies have shown that when a patient develops resistance to EGFR inhibitors, more than half the time it is due to the emergence of a new "gatekeeper" mutation, called T790M. Currently, there are no targeted therapies approved for the treatment of this mutation. CO-1686 is an oral investigational drug discovered being developed by Clovis Oncology to selectively target both the initial EGFR mutations and the T790M resistance mutation. Dr. Jonathan Goldman, an assistant professor of hematology–oncology and member of the Jonsson Cancer Center, was one of the leaders of a study of 88 patients with advanced non–small-cell lung cancer who had previously been treated with an EGFR inhibitor and had developed resistantance. In a Phase 1 trial, CO-1686 was administered continuously to the patients in 21-day cycles. Response to the drug was seen in 58 percent of the patients. The benefit has been durable, with more than 75 percent of patients still on the drug at the time the study was analyzed. Treatment-related side effects, including elevated blood sugar levels, were for the most part mild and manageable. "The results we’ve seen with CO-1686 are very promising," Goldman said. "Many of these responses are very dramatic, and the result is that patients can feel better and live longer, often with fewer side effects than chemotherapy."